Today I have 2 polishes from the January 2012 Essence Trend Edition called "Crystalliced". The nail polish collection of this TE consits of 5 different soft shades. 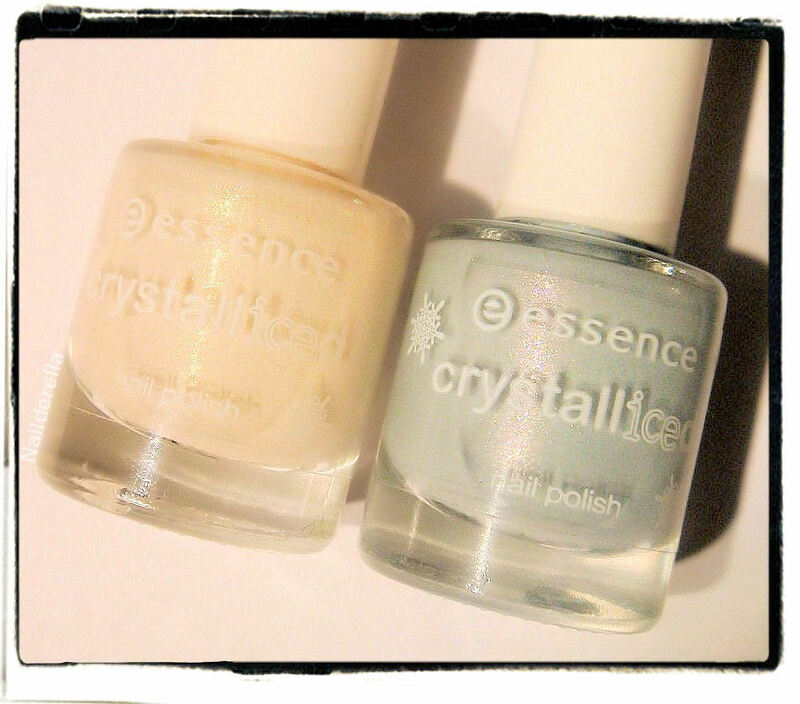 I really love soft shades especially at the moment but I'm being more difficult with polishes, I chose them more carefully now, so I bought only 2 of them: 05 Frosted Champaign and 04 Ice Eyes Baby. The others shades are 01 It's a snow-woman's world, (grey creme) 02 Ice crystals on my window (rosy shade), and 03 Iced age reloaded (taupe with a purple shimmer). So let's go to the first one, 05 Frosted Champaign! It's a light champagn colored polish with a very nice gold shimmer. Moreover, when you look really carefully, you can spot some tiny copper flecks in it. It's not that obivous unless you really look carefully at the nails, but I think it adds an interesting dimension to the polish! 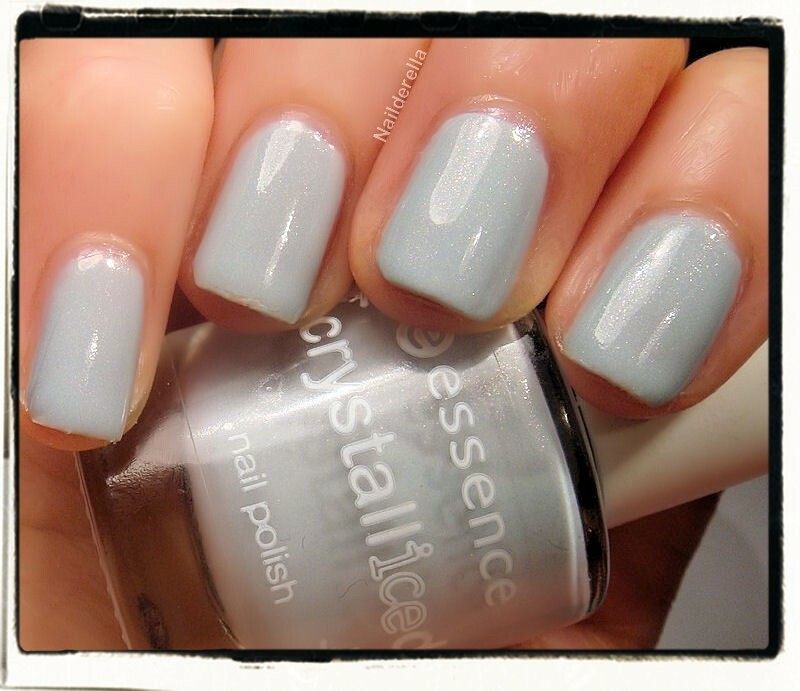 04 Ice Eyes Baby is a baby blue with grey undertones. There is also a shimmer in it. 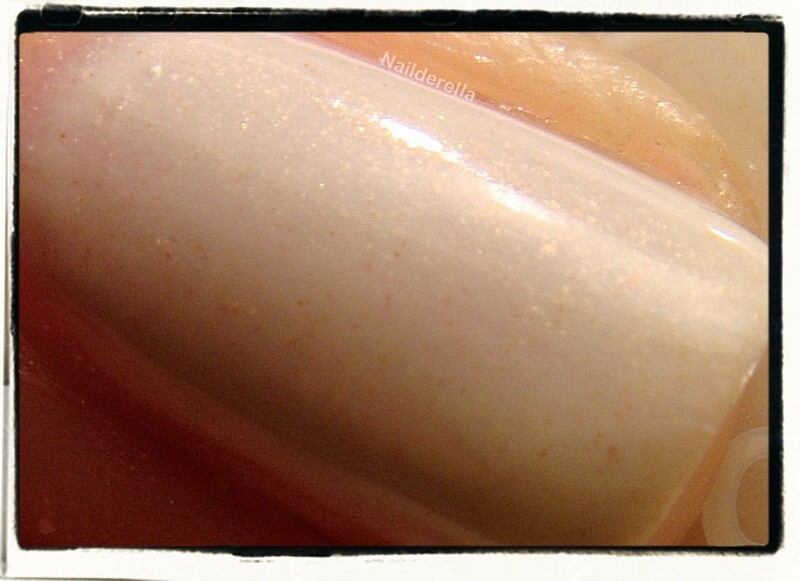 In the bottle, you can cleary see a purple shimmer (cf the 1st picture of this post). However, on the nails, you rather see a silver/light blue/gold shimmer while the purple shimmer is hard to capture. It's very very subtle compare to the silver shimmer. Final verdict: I'm really pleased with this soft shade collection by Essence because it fits the winter feelling exactly. 05 Frosted Champaign is a really nice and wearable "white" polish due to its champagn base color and its golden shimmer. Morever, the tiny copper flakes in it make it really interesting. However these flakes are not so pronounced so it's a bit hard to see them very well. Maybe more of them would have added even more depth to the polish. The formula was all right, nothing extraordinary nor bad. I used 3 coats to get a good opacity. 04 Ice Eyes Baby is one of my current favorite polishes!! 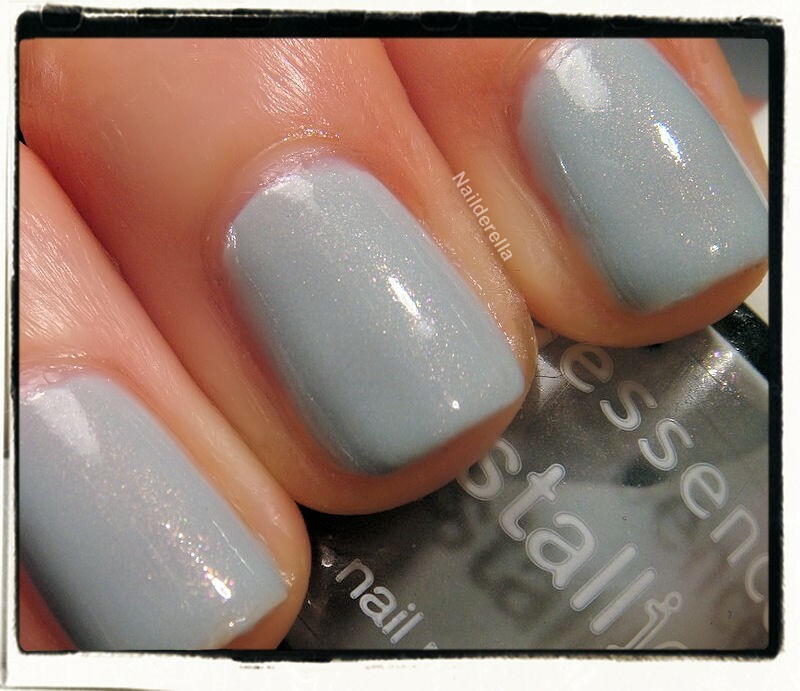 Maybe you've already heard how much I love grey and grey creme polishes. Here you have a light blue greyish polish with a great formula and a very pretty shimmer. I've always wanted to have a baby blue polish but I've never been really happy with any of the ones I have (e.g., OPI What's with the cattitude), with 04 Ice Eyes Baby, blue and grey are so well-balanced that it is, for me, the perfect light blue I've been searching for a long time! 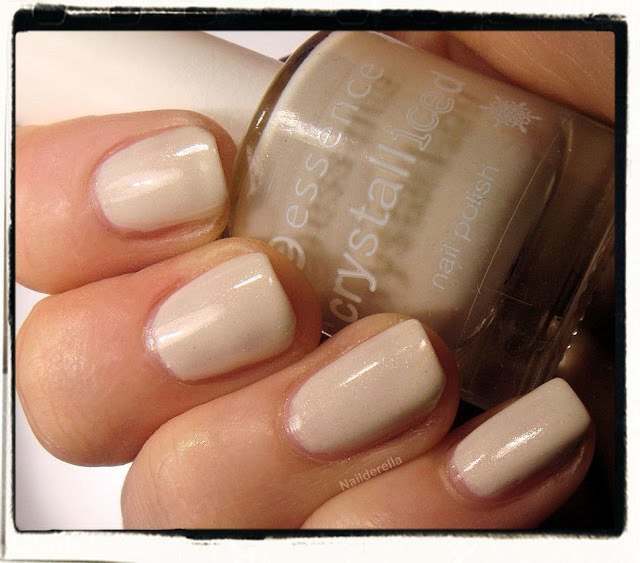 The formula was great, with 2 coats to get full opacity. Maybe some people would have wanted the purple shimmer to be more present on the nails but I think it's pretty like it is! I really love this polish. It will be my go-to polish now! Keep in mind, this is collection is a special edition that is on sale for just a short time.